Puffers! Moto styles! Trench coats! 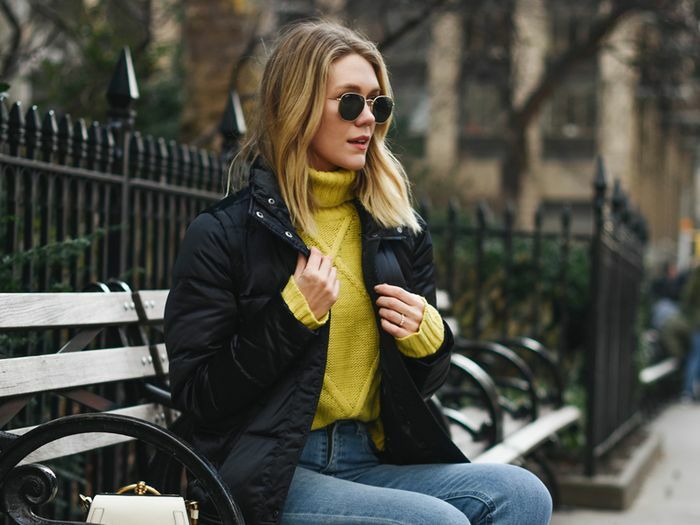 There are clearly plenty of fun jacket trends to go around this winter, but today we’re training our eye on styles that are versatile enough to last us all (bone-chilling) season long. To that end, we enlisted the help of Rebecca Laurey and Cheralee Lyle, two NYC-based fashion girls who were able to help us identify four trusted Andrew Marc picks, not to mention plenty of cool ways to style them for the holidays. Keep reading for the inside intel. Moto jackets and jeans are like peanut butter and jelly: You actually can never go wrong. Laurey didn’t shy away from styling a fringed moto style with her trusted blue jeans. “In this case, I went for flared denim pants because, hey, I’m Dutch and love my denim.” Us, too (on that latter point, anyway). We really love this rock ’n’ roll–inspired classic jacket: It’s definitely one to add into your wardrobe rotation this winter. Clearly we have a thing for hoods… They make a world of difference this time of year. Lyle agrees, and she tells us she fell for this particular style despite it being a bit sportier than the ones she’s normally drawn to. Her advice: Follow the jacket’s utilitarian lead and style it with similarly laid-back off-duty pieces. What we love most about this specific down jacket is that the fur is removable, making it versatile enough to wear from day-to-night. This on-trend look is one you can easily put together for an early morning coffee run come Saturday morning. We’re constantly in awe of Lyle’s enviable outerwear—especially her go-to belted wool trench. This Marc New York style’s a classic for a reason, but she’s also freshened things up by wearing it with a sweaterdress and over-the-knee boots. We’re especially into the removable hood, which feels absolutely necessary even here in L.A. where rain is something of a miracle. A little too cold to get away with bare legs? Layer with tights or jeans and stay perfectly toasty.